No? It's ok. I know, it's been a looooong time. But today is a day as good as any to resuscitate this poor excuse for a blog. 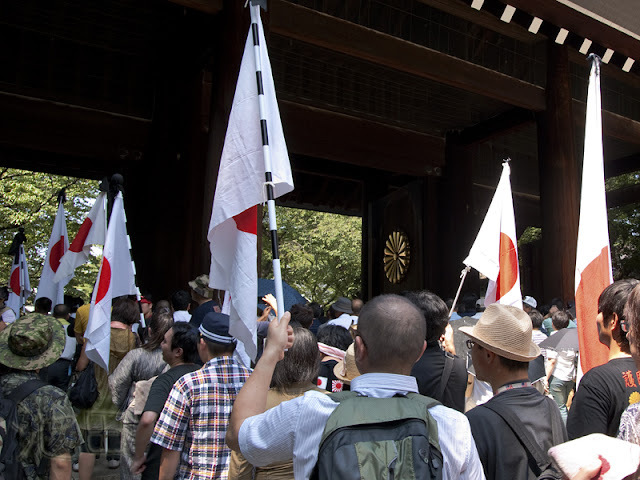 Yesterday was August 15th, and if you wanted to experience a side of Tokyo not very often seen by foreigners (or locals, for that matter), the place to be was Yasukuni-jinja. Yes, the controversial shinto shrine. True, the shrine is there all year long, but on August 15th (the anniversary of Japan's surrender in WW2), the circus comes to town. Yesterday was no different. At least on the surface. At least to a casual observer. 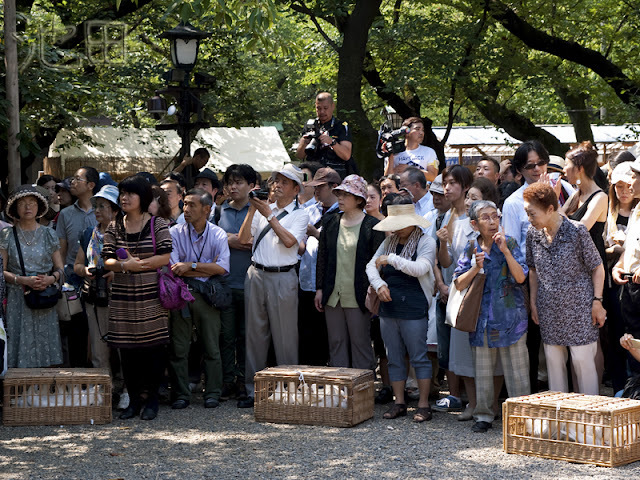 But if you'd been to Yasukuni on other 15ths of August, you could tell that this year it WAS different. How? It was boring. My boggingly boring. And for the most part - very orderly and civilized. 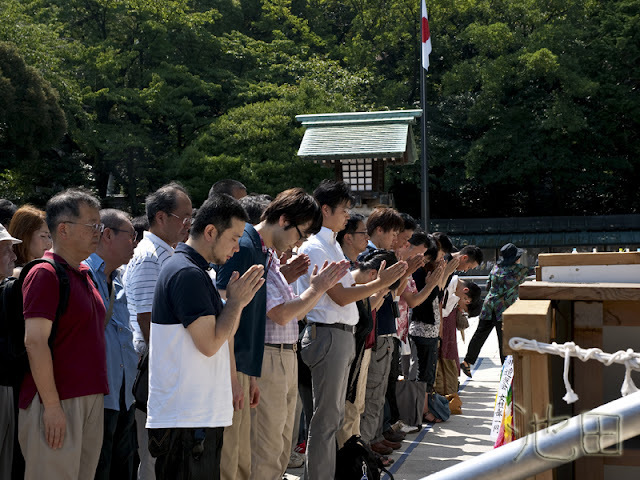 People came, paid respects, clapped their hands shinto style, bowed, and left. Next! The only half-memorable event was held at 10 AM. 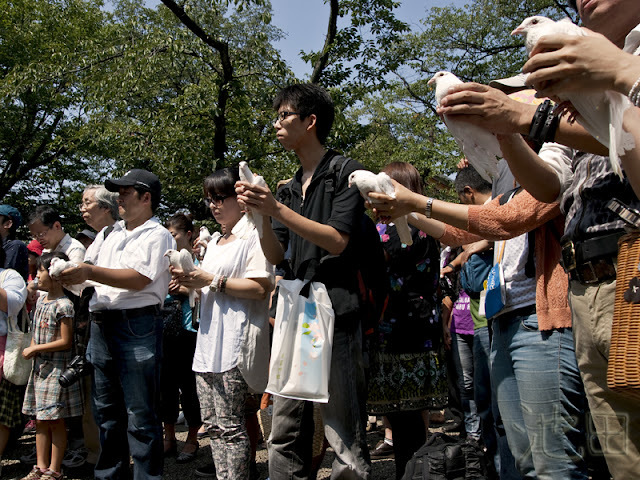 In one of the shrine precincts, a ceremony dedicated to World Peace took place. 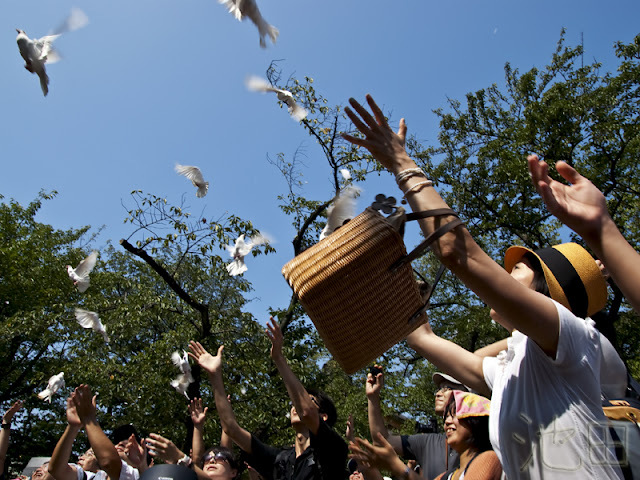 Spectators were handed white doves, and after a minute of silence, at 10AM sharp, the birds, as symbols of peace, were released into the sky. This time I was on time and this is what I saw. Yep. The birds are all here. The people and photographers, too. All ready already! 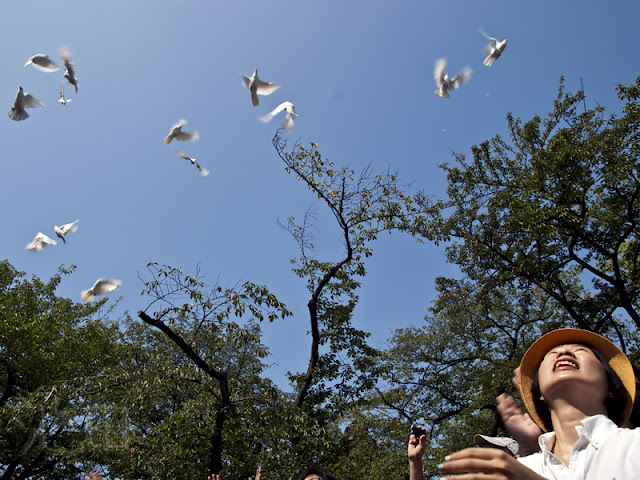 At 5 minutes to 10, priests and shrine maidens started handing out the birds. I was repeatedly asked to take one, and repeatedly, I had to decline. 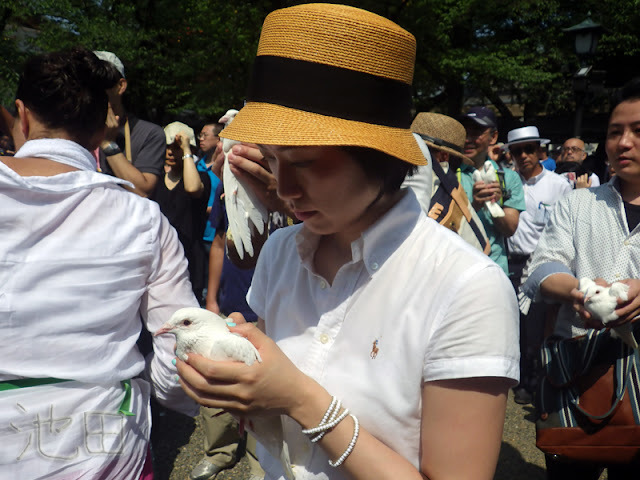 The reporter standing next to me was quite unhappy about it, he really wanted to have a shot of a dove-holding gaijin woman at Yasukuni, I suppose. He made his dissatisfaction known by "accidentally" hitting me with his bag and his equipment. Over and over again. I finally put an end to it by pushing myself in front of him. Stupid jerk. 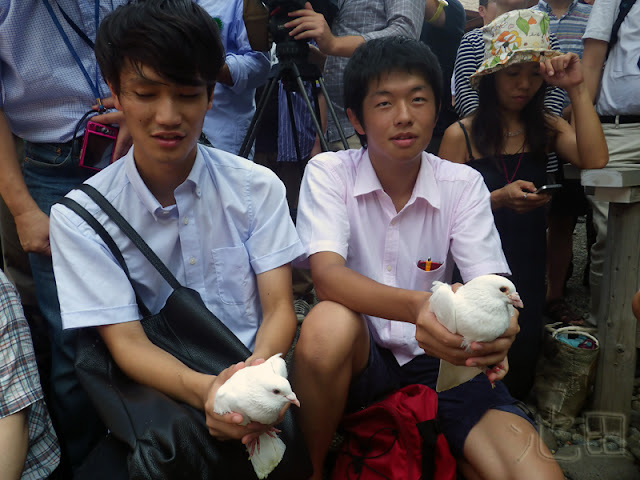 The people around me were holding terrified birds. To be fair, some people were equally, if not more, terrified. 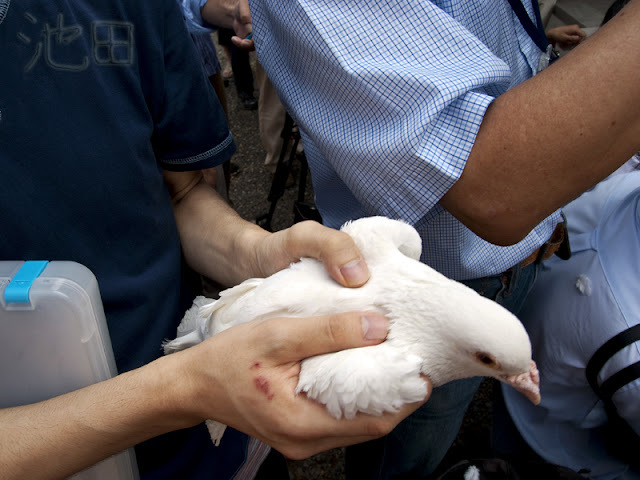 Especially one young man who got a special present from his dove. A second after I took this photo, the guy on the right got shitted (shat?) on. That's what you get for squeezing a pissed off pigeon. Peace to the world, la la la la... Oh, wait. That's a different occasion. 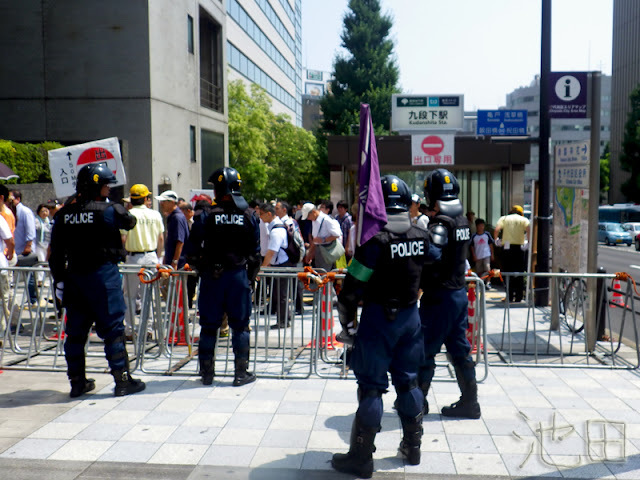 Ehhh... what is this world coming to, if a common gaijin knows the August 15th right-wing etiquette better than right-wingers... Shame on you, uyoku boys, shame! And, as always, Tokyo's finest were at the scene, doing what they're best at - directing pedestrian traffic. In full bunker gear, no less. This team here, positioned very strategically by the first Kudanshita subway entry/exit, was very helpfully announcing that this exit is for exiting only. To enter the subway, please go 50 meters straight ahead, thank you very much, and we apologize for the inconvenience. 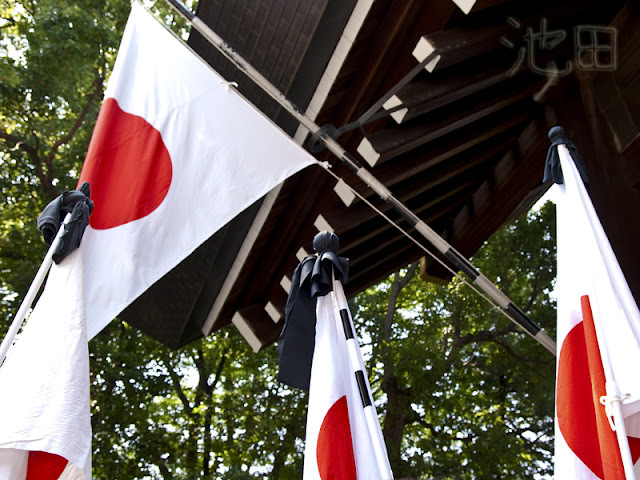 And that was the day at Yasukuni-jinja. 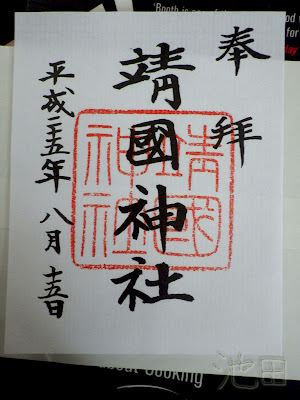 I got me a goshuin (red shrine/ temple stamp) as a souvenir and went back home. I doubt I'll be back next year. Honestly, I'd rather play solitaire mahjongg and eat potato chips. But this trip gave me a much needed excuse to visit the import store at the station in Uts. I bought tortillas and salsa. Yay!